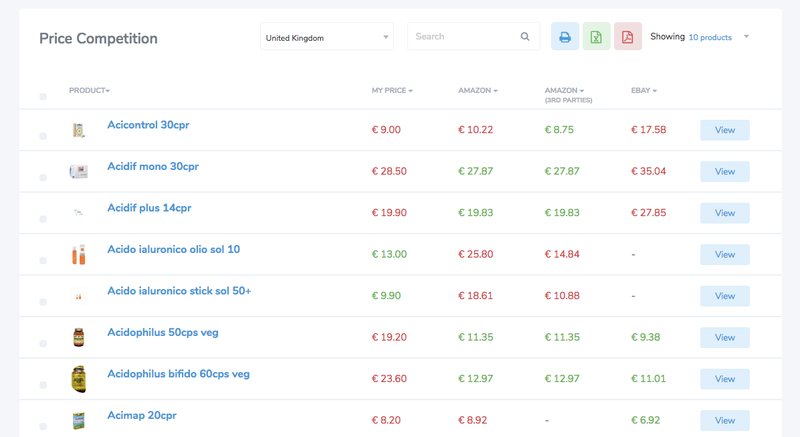 One of the PRICEFY.IO main features is the automatic price monitoring of Amazon. It is Free and included in every package level. To start analyzing if your products prices are lower or higher than Amazon you must import your catalog. Here a guide about how to do that. Once your catalog is imported, PRICEFY.IO will start analyzing your products prices comparing them with Amazon and other marketplaces like eBay. The results are listed in the "Price Competition" section and red or green color is applied to every price letting you understand if is higher or lower than your.